Seb: As usual, the daily dose of Italian ships! The Trento-class is the first heavy cruiser built under the Washington treaty. As most Italian ships of the ’20s and early ’30s the Trento-class was designed to be fast: if forced its machinery was able to make her sail at 36 knots. To achieve this result the machinery had to be powerful but, most importantly, heavy(over 2300 tons in weight), leaving the rest to armor and armament. The most sacrificed aspect was the armor since it wasn’t able to protect the ship from 8″ shells. Armament on the other hand on paper wasn’t that sacrificed: eight 203/50 in four twin mounts as primary and sixteen 100/47 in twin mounts as secondary. The main issue was the fact that the primary armament mounts weren’t that successful and spacing wasn’t that great(as shown in the image above). Two ships of this class were built: Trento and Trieste. Both served with the fleet and took part on the major engagements between the Italian and British Navies. Both were lost during the war: Trento was damaged by torpedo bombers and then sunk by a submarine on 15/6/1942 while Trieste was lost during an aerial bombardment of the port of La Maddalena(a base in Sardinia) on 10/4/1943. Considered as a “magnificently executed mistake” the Bolzano is an iteration of Trento done some years after, while the Zara-class was already in construction. Due to the similarity to the older half-sisters is sometime considered as part of the Trento-class although there are some differences between the two. 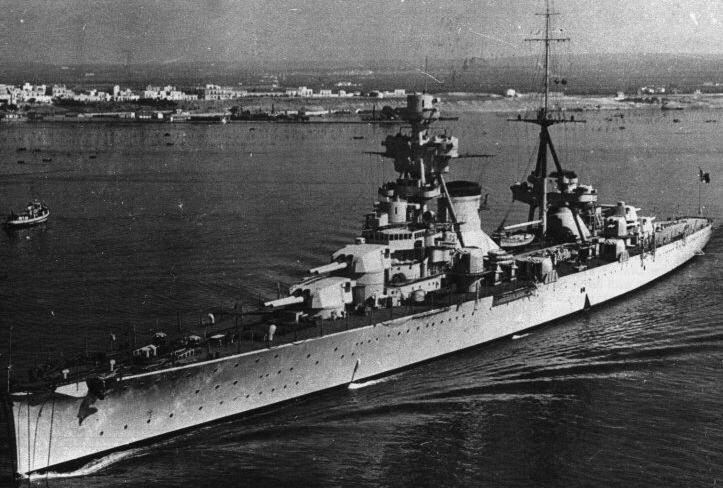 The main ones are the following: the primary armament was changed, replacing the older turrets mounted on Trento with the newer ones mounted on Zara(with the newer 203/53) and then a reworked machinery and then the anti aircraft armament was changed a bit(the older 12.7/62 were replaced from construction by the 13.2/76 in twin mounts). 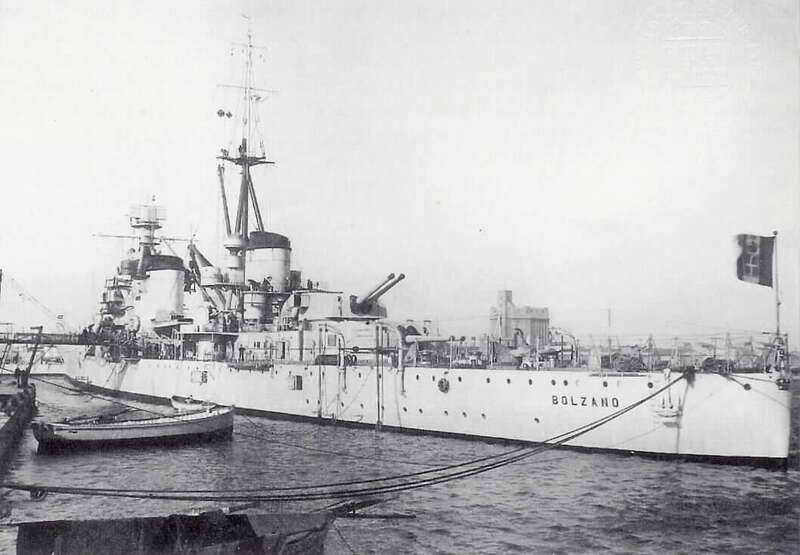 Bolzano primarily served with the fleet and was damaged by a submarine on 13/8/1942. She was towed to La Spezia where repairs were started. It was thought a conversion to a “semi-carrier”(12 planes with 12×90/50 and 20×20/65 as AAA), conversion which didn’t happen due to the Armistice. She was still under repair when the Armistice became active and the Germans took control over her. She was then sunk on 22/6/1944 by Italian frogmen on chariots. Due to the similarities with the Trento and considering how i treated the Condottieri-classes i think it’s wiser to place Bolzano with her half sisters as preset. Regarding her conversion since the planes weren’t supposed to be recovered i don’t think she can be considered in that configuration. In both cases things may change. The Zara class is the best cruiser available in the Italian Fleet. The original design was supposed to have a 200 mm thick belt with a speed reduced to “only” 32 knots. There was just a problem: the displacement exceeded the Washington limitation by almost 4000 tons. To make the project fit the designers started to reduce weight as much as possible: the belt thickness was reduced to 150 mm, the torpedo tubes were eliminated and the hull was reshaped(degrading sea worthiness in the process). The weight was decreased but there were still over 1500 tons in excess. Instead of cutting down that excess Italy decided to forget about it and say the displacement was 10000 tons. 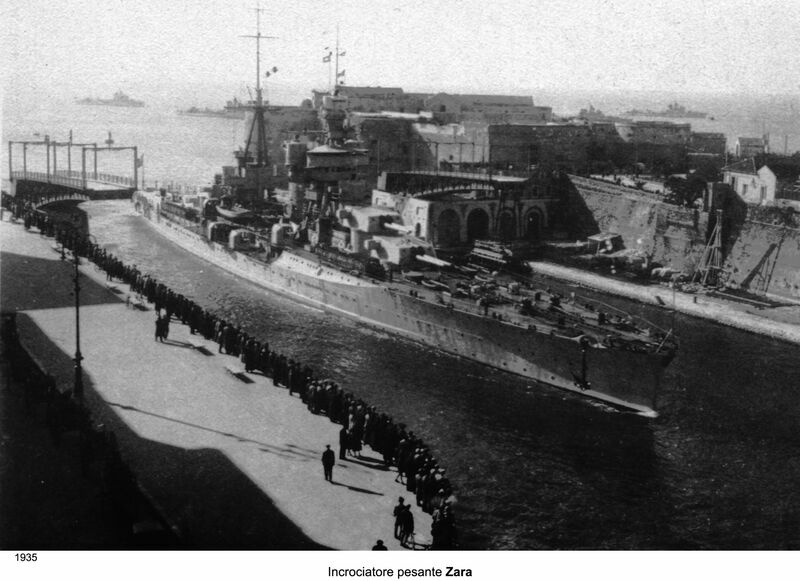 Four ships of this class were built: Zara, Fiume, Pola and Gorizia. Three of them were lost at Cape Matapan. Gorizia survived because she wasn’t part of the same division of her three sisters and thus not sent to retrieve the disabled Pola. She was then damaged at La Maddalena when the Trieste was lost, towed to La Spezia and captured by the Germans. She was scuttled by the crew during the Armistice, salvaged by the Germans and then sunk again by Italian frogmen on 26/6/1944. I don’t have that much info on this project other than the technical data. Sadly my knowledge isn’t that much on this project. I know it had a displacement of between 19000 and 22000 tons, armed with nine 250 mm guns(3×3) and with a designed maximum speed of 37 knots(taken from Stalin’s Ocean Going Fleet). I hope to find something more info and/or waiting for WG to find it. I may ask to Ansaldo if they have something although it’s a big a if. I assume it will be more or less similar to the top tier Russian cruiser as far as layout is concerned although it’s just an assumption. As for the project for Spain i will update when i have more info.